Leather has many different uses. From high-fashion wear, to furniture, to vehicle upholstery, you can go almost anywhere and find an example or two of leather products with ease. However, the process for making quality leather goods tends to be long and involved—it involves everything from shaving and preparing the hides to tanning, dyeing, shaping, and re-tanning them to achieve a specific finish or soften the hides. Further complicating the matter is the fact that there are numerous kinds of animal hides that can be used for leather—everything from the common cow or pig hides to rarer, more exotic materials like snake or alligator skins. When tanning leather, one of the main challenges is that one mistake can ruin the product (or, at least, can be difficult to repair). For example, if the wrong dye is applied, then the hide will have to be bleached to remove the dye so it can be dyed again—which can affect the quality of the final finish by removing the hide’s natural markings. Leather is usually pretty tough—after all, it is frequently used for hard-wear applications such as motorcycle gloves, jackets, and other protective wear meant to save the wearer from road rash should they crash. Changes in ambient humidity conditions during the tanning process can have a significant impact on the tensile strength of leather—making it either easier or tougher to break. This has been a known issue for decades. In fact, one old study of the effects of moisture on leather quantified the changes in the tensile strength of both vegetable and chrome-tanned leather that occurred at 21 degrees Celsius and different ambient humidity conditions. In the study, reduced humidity conditions negatively impacted the ultimate tensile strength of leather. At a relative humidity (RH) of near 0, the tensile strength of the vegetable-tanned leather was 4,630 lbs. per square inch, while the tensile strength of the same kind of leather at 83.8 RH was 5,290 lbs./sq. inch—a difference of nearly 12.5% in the leather’s tensile strength! Another test of chrome-tanned leather showed a tensile strength of 3,170 lbs./sq. inch at near 0 RH, and a tensile strength of 5,420 lbs./sq. inch at 97.1 RH—a difference of around 42%. Being able to maintain the right humidity conditions is crucial if you’re going to produce leather with the right level of softness or strength for the leather’s intended use. Also, the increased effect of humidity on chrome-tanned leather over vegetable-tanned leather is worth noting. One of the main reasons why leather makers tan hides is to turn the organic, degradable hide into a inorganic material that won’t rot. However, prolonged exposure to high humidity conditions can still promote the growth of mold and bacteria in leather. Moisture inside of the leather can also lead to bacteria and mold growth that may rot the material. Leather is typically sold on the basis of its overall quality and surface area. Smaller pieces of leather with holes or other quality issues are, generally speaking, far less valuable than larger pieces that are free of defects. Water in a hide that is being tanned can cause it to swell slightly, making the leather thicker. However, after that water is removed the hide will shrink slightly. This can be a problem if the hide is sold at the water-bloated size, but shrinks to a smaller size when it reaches the buyer. To prevent potential issues, it may be necessary to check the moisture content of leather before selling it to make sure that the leather is not likely to experience shrinkage after being sold. 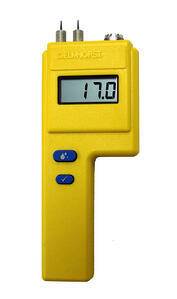 The fastest way to check the moisture content of leather is to use a specialized leather moisture meter. These moisture meters use a pair of electrodes to penetrate a piece of leather and pass an electrical current between the two electrodes. The amount of resistance to this electrical current is used to determine how much moisture is present in the leather. The wetter the leather, the less resistance there will be. By making rapid moisture checks in leather products throughout the tanning process, tanners can make sure that their goods are at the right moisture content to maximize quality and prevent issues such as mold or bacteria growth during storage. The process for using a moisture meter for leather is simple: just put the meter’s pins/electrodes in the leather and push a button. Once this is done, the meter will give the user a measurement of the moisture in the leather that can be recorded and used to determine if the leather is too wet, too dry, or just right. Considering the impact that relative humidity can have on leather goods—particularly chrome-tanned leather, it’s important to monitor RH whenever possible in the tannery. For this task, a specialized device such as a thermo-hygrometer is typically used. To take a measurement of relative humidity in the tannery, simply turn the hygrometer on, place it in a spot with good air flow, such as near the center of the room, and activate it. The hygrometer will evaluate the room’s RH and provide a fast measurement that you can use to determine whether you need to take measures to adjust the room’s humidity. While it might be tempting to simply leave a thermo-hygrometer in the room to take continuous readings of the tannery’s RH levels, this isn’t generally recommended. The chemicals given off by tanning vats can cause damage to an RH sensor over time—which would make readings less accurate. By only using the hygrometer when necessary and keeping it in its storage case when not in use, you can prolong the useful life of the hygrometer’s sensor element. Want to maximize the quality of your leather products by monitoring and controlling their moisture content? Contact Delmhorst today to learn more about measuring moisture in leather, or to find a leather moisture meter distributor near you!